The 7th Reg.,Quick March Surrender of Paris . With thanks to Virginia resident , Fifer and Drummer, Joe Whitney, I can publish The Surrender of Paris, obviously the same tune as The Downfall of Paris, but with interesting variants, including a unique Tag, After reading my article Le Carillon National, Ah! ça ira and the Downfall of Paris., Mr. Whitney wrote to say, “But what about The Surrender of Paris and kindly directed me to The National Tune Index and The Cadbury Research Library of Birmingham University. 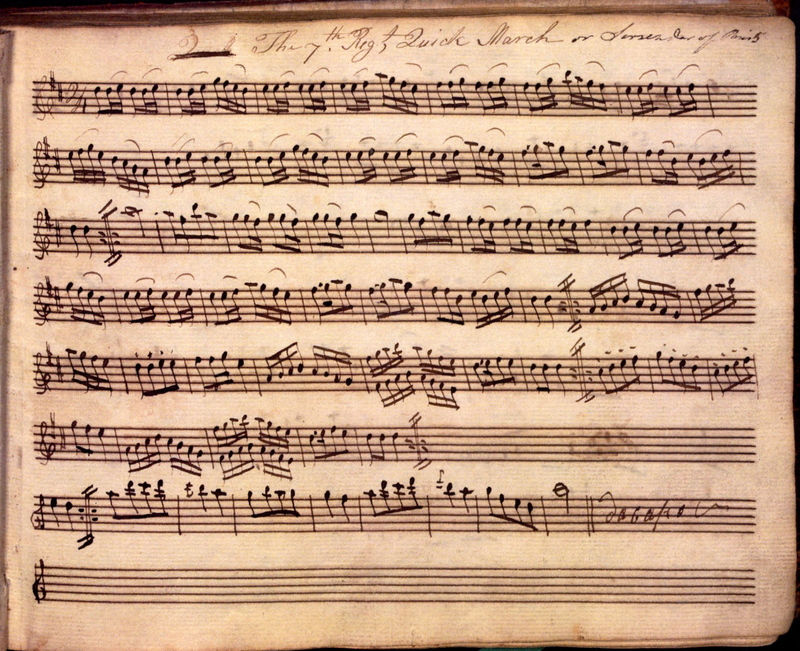 I have up-dated the Le Carillon National article with this latest manuscript and details on the 7th Regiment provided by John Moon, former Musickmaster, Colonial Williamsburg Foundation. This original manuscript is on page 5 of a book in the Cadbury Research Library, Molyneaux MS-1, Birmingham University. The book is dated on an inside cover 1788. If this date is accurate, it help to will confirm English authorship and the earliest version known of what later became The Downfall of Paris.